This polyphonic (8 voices), programmable synthesizer featured a 49-note (C-C) non-velocity keyboard, MIDI, one DCO per voice, a single VCF, three six-segment envelope generators (one for each group of 4 oscillators, and one for the VCF or noise generator), battery power, and two strap buttons, which, combined with its light weight, made it a truly strap-on synth. The batteries lasted approximately 6 hours. It allowed layering both banks of oscillators for much better (fatter) sounds, although it reduced the polyphony to 4 voices. The Poly 800 also featured a simple 256-event step-time sequencer and a simple chorus. 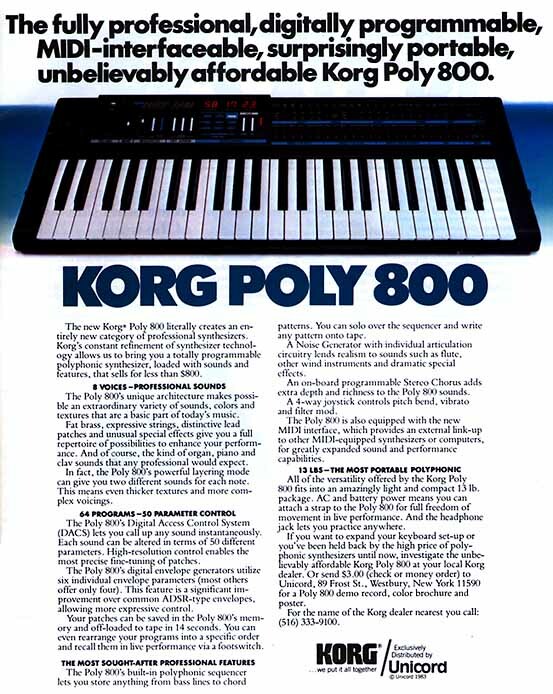 The Poly 800 II featured improved MIDI, and a comprehensive digital delay instead of the chorus. It was also slightly darker brown in color.